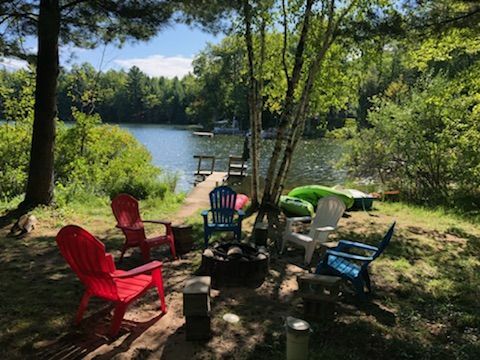 Fantastic spot for true peace, rest, and relaxation at "Da Mitten Chalet", located in South Boardman on Perch Lake. A cozy, quiet 3 bedroom,1 bathroom retreat that sleeps up to 8 guests. There is one bedroom on the lower level with 2 twin sized beds. The upper level features 2 bedrooms each with 1 queen bed. In the living room, sit back and enjoy the TV/DVD player (no cable) while relaxing with a fire in the woodburning stove on a cool evening. Small, but full, kitchen with diswasher. WIFI. The screened-in porch is fantastic, overlooks the lake, and has a futon for additional sleeping. It is the perfect spot to start and end your day. Located right off the kitchen makes it easy to prepare meals and dine on the porch. Sheets and towels are provided. Outside enjoy a nicely treed property that walks down to the lake. Hop in the provided kayak or paddle boat and enjoy the lake. Dock. If you are bringing a lake toy you can tie off on the mooring. This is a no-wake lake (powered watercraft are not permitted). Fire pit and gas grill are located near the water's edge. The kids, of all ages, can enjoy a swing set, horse shoes, and a corn hole game. You will love it here at Da Mitten Chalet. A perfect family spot. Traverse City is about 30 minutes from this location. Your well-mannered pet is welcome. No smoking. No air conditioning, but fans are provided. 40 minutes to Traverse City. Will consider short stays during any season. Prime Summer 3 night minimum or weekly Friday to Friday. Short stays are permitted during prime summer dates, however, deposits will not be charged for reservations totaling less than 7 nights that are booked online until the reservation is confirmed by Visit Up North the next business day. Arrival and/or departure date must back up to existing reservations and/or begin/end on a Friday. Perfect for our needs. Kitchen fine for meal prep. TV doesn&#x2019;t work. Wasn&#x2019;t dying to watch TV but would have been nice. WiFi a plus. We could not get either door to latch so we were unable to lock up. That&#x2019;s significant. Thank you for staying at Damittens. We do not advertise cable at this home. We do have DVD and movies as well as internet however. We have replaced the doorknob. I have three teenagers who don't get excited over much of anything anymore unless it's Electronics. As soon as we arrived to the home all three of them ran to the lake. The smiles on their faces when they came back up stating mom there's kayaks and a paddle boat, was priceless. We spent all of our extra time out on the lake together. It was a great experience and wonderful memories were made. We love hearing a good family story. How wonderful for Mom and the kids. Please come and visit us again soon. The house was really nice and clean. Lots of activities to do as well. Like outdoor games, kayaks, paddle boat. Very peaceful surroundings. But having only one bathroom was a bit tight for 6 people but we made it work. The rental company was very nice and accommodating. I would highly recommend the rental company and the house. Da Mittens was a cute little cabin to stay in. My review is more for the homeowners and some things that need to be looked into for improvements that may have been overlooked over time. Needs a new shower curtain (moldy), part of the dock goes underwater after a rain, the DVD player has an issue with sound, the swing needs a clean up and maybe some new wood for sturdiness,the fire pit could use some chairs instead of cement blocks. The housekeeping should sweep corners for cobwebs. A window air condition unit would be helpful in July! The yard needed cut but maintenance came out promptly and handled that! The inside was updated and cute. The outside could use a little attention since most people want to enjoy the outdoors as well. We loved the porch and the kayaks, paddle boat the best. Also it's a great place to walk your dog. Thank you for your suggestions. The shower liner has been replaced. There is not much that can be done about the dock (it is a permanent dock so no adjustments) since late spring and early summer we see high water. It typically goes down in the summer. We will look at getting fire pit chairs and stiffen up the swing as well as additional grooming of the exterior. It is a sweet place to enjoy indoor and outdoor fun! . It was nice to get a way for a couple days. The weather was perfect and no mosquito. Seen a red head wood ******. The man next door was nice and said hi to me. You don't get to many people that are nice anymore. The birds are so wonderful up north here especially in the Spring and Fall, so glad you enjoyed your stay and hope you come back soon! What a wonderful cottage on the lake! So peaceful and beautiful. The kitchen was perfect and the living room cozy. We had a great time and our dog loved watching fish from the dock! We are thrilled that you loved your time up here in our wonderful area and hope to see you back again soon!